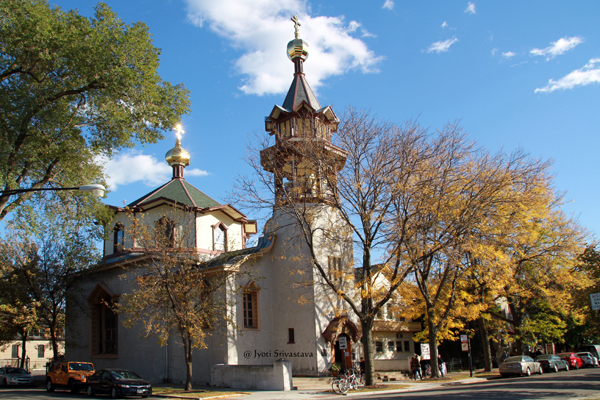 Holy Trinity Orthodox Cathedral is the cathedral church of the Orthodox Church in America Diocese of the Midwest. Location: 1121 N. Leavitt St.
/ Ukrainian Village neighborhood of Chicago. The church was elevated to a cathedral in 1923. 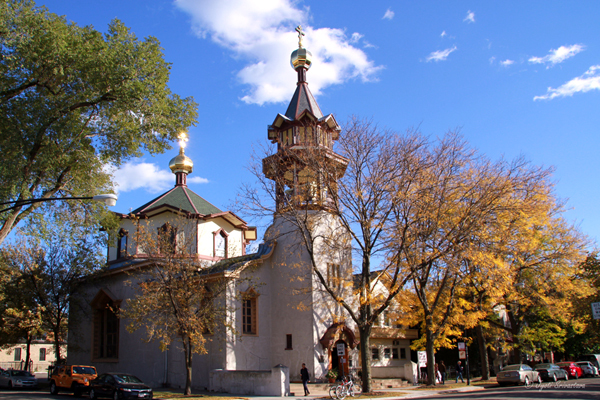 Listed on the National Register of Historic Places in 1976. Designated a Chicago Landmark in 1979. 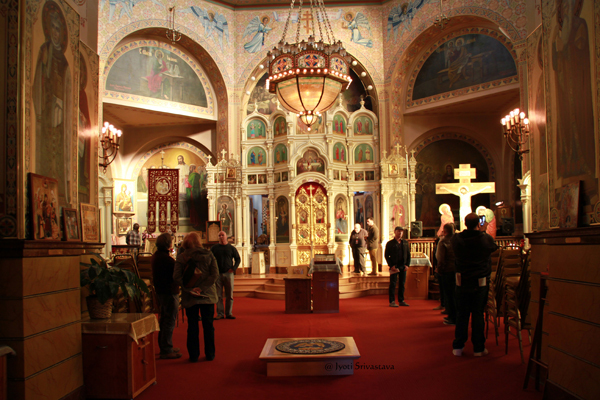 Official website, Holy Trinity Cathedral.. click here..
Holy Trinity Orthodox Cathedral stands in the Ukrainian Village neighborhood of Chicago. 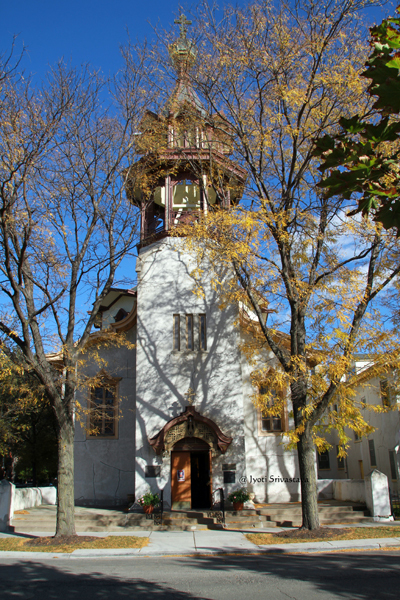 Holy Trinity had its beginning when a small community was established in 1882 as St. Vladimir’s. 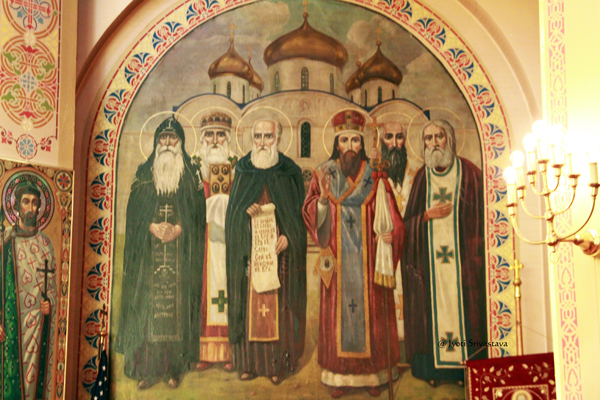 The founders of the church were immigrants from Carpatho-Ukraine, Galicia, and the Balkans. 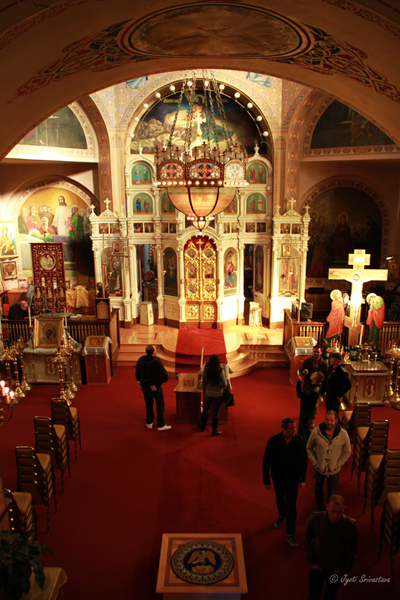 In its early years of existence, the cathedral parish served as a catalyst for the establishment of several other Orthodox parishes in the Midwest. 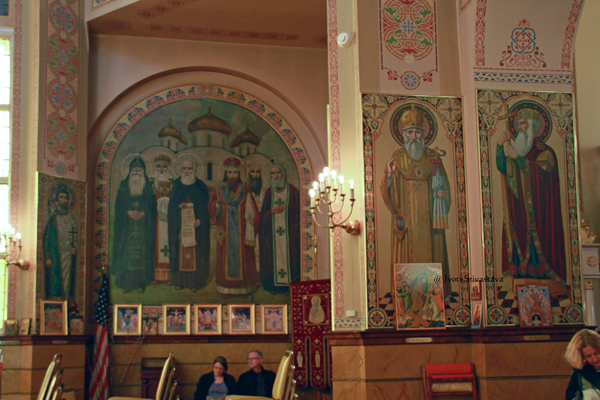 It has served as a means of uniting Orthodox immigrants in the Chicago area, providing the guidance and leadership for several of the Midwest’s Orthodox parishes. 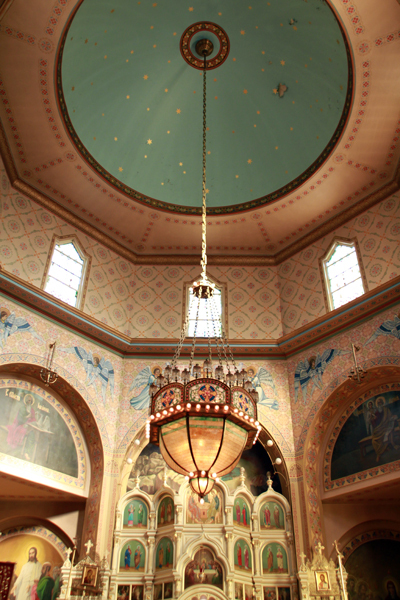 A bell tower centered over the front entrance, and.. 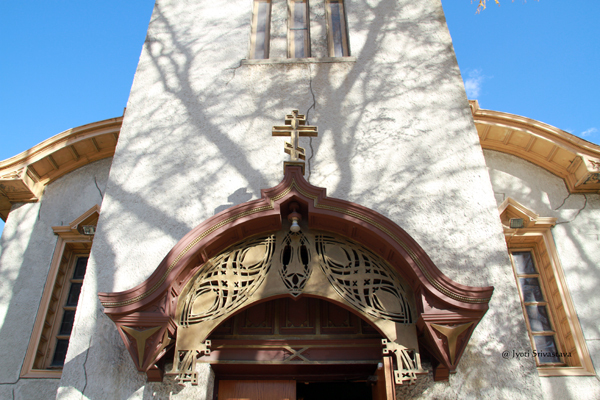 Roof peaks surmounted by the distinctive three-barred Russian cross. 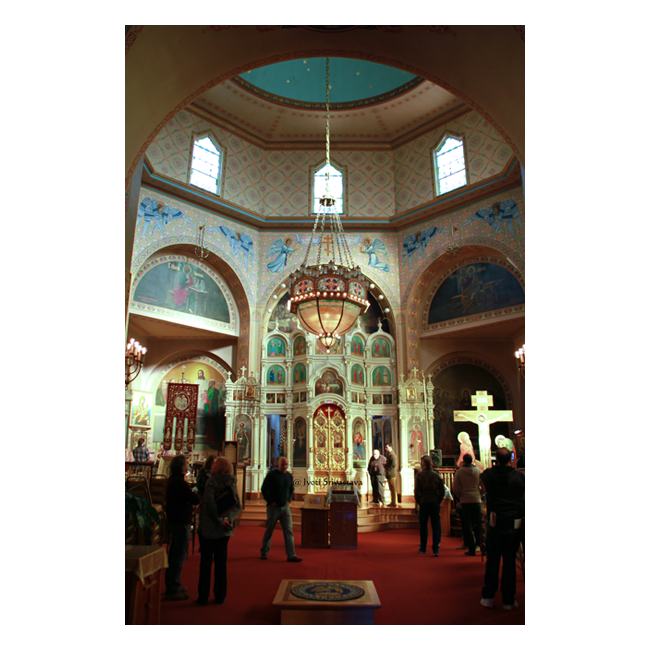 The cathedral’s interior is based on the St Volodymyr’s Cathedral in Kiev, Ukraine… click here.. 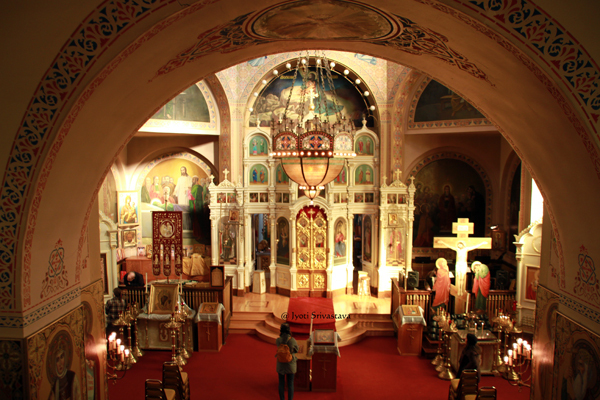 The church was elevated to a cathedral in 1923, and stands today a proud member of the Orthodox community in Chicago. 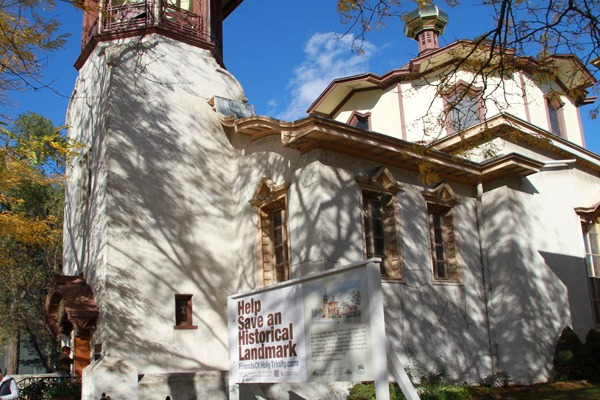 It was listed on the National Register of Historic Places in 1976. 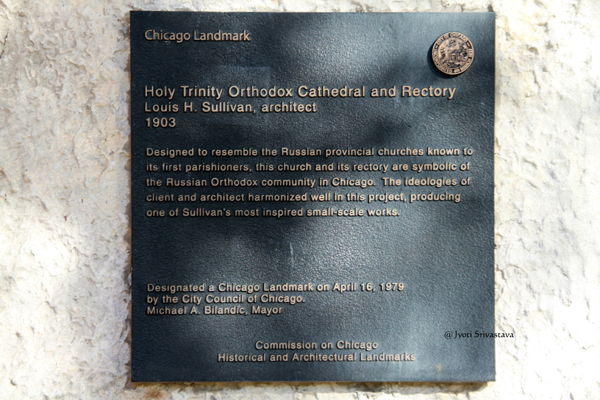 It was designated an official City of Chicago Landmark in 1979. 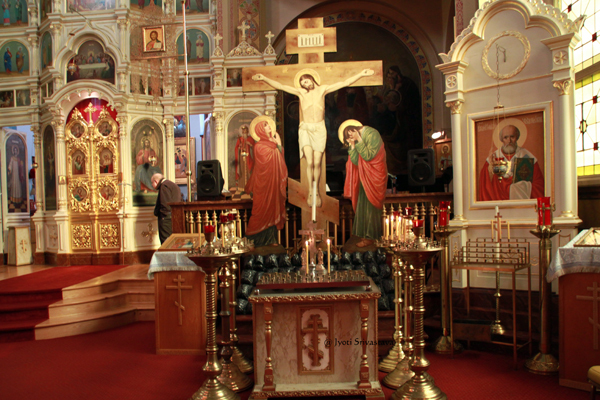 Reference: Holy Trinity Orthodox Cathedral website.. click here.. 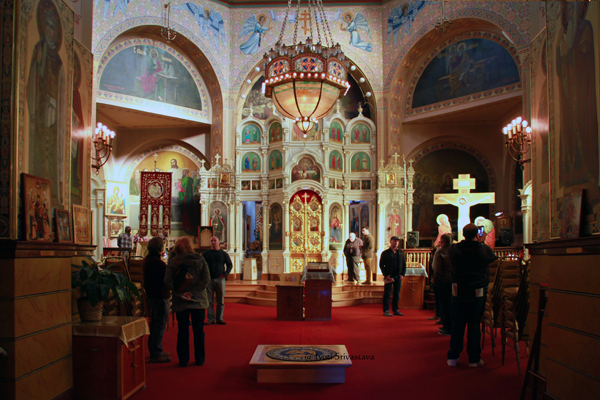 The centerpiece of the sanctuary is the icon screen or the iconostasis, separating the nave from the sanctuary. 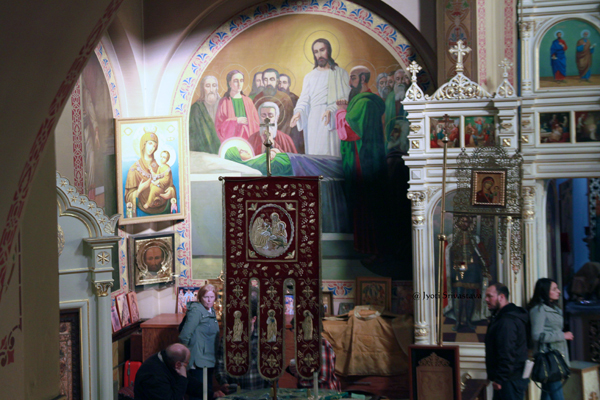 It is decorated with icons depicting scenes from the life of Christ. 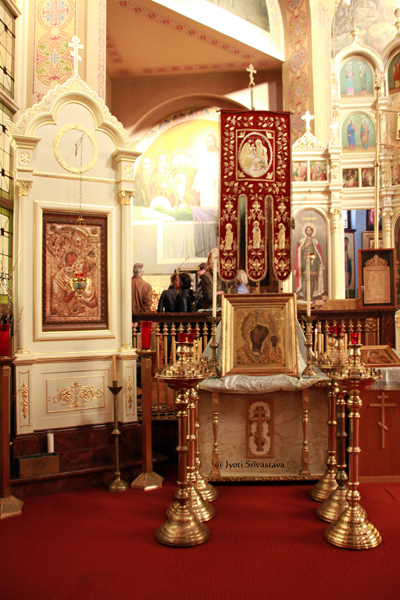 It was brought from Russia and donated to the church in 1912. 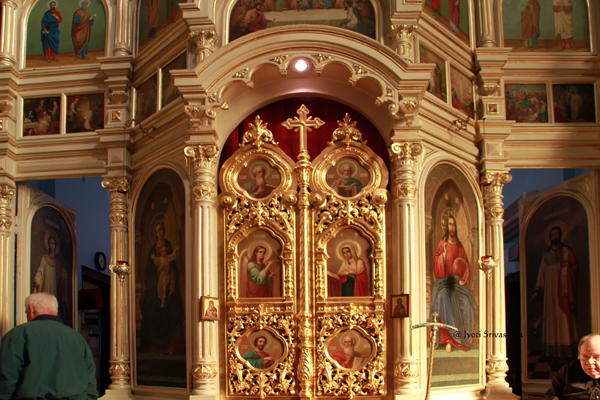 The iconostasis typically has three openings or sets of doors: the Beautiful Gates or Holy Doors in the center, and the North and South Doors to either side. The Beautiful Gates are sometimes called the Royal Doors. They remain shut whenever a service is not being held. 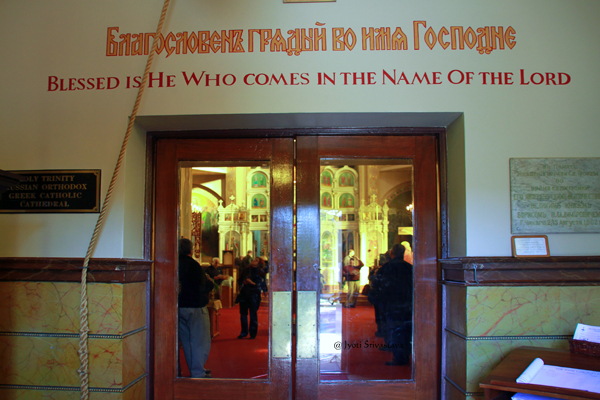 The North and South Doors are often called Deacons’ Doors because the deacons use them frequently. 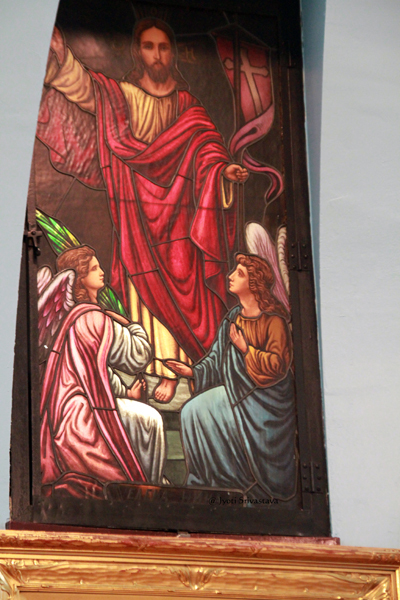 Alternatively, they may be called Angels’ Doors, and the Archangels Michael and Gabriel are often depicted there. The South Door is typically the “entrance” door, and Michael is depicted there because he is the “Defender”; the North Door is the “exit”, and Gabriel is depicted here because he is the “Messenger” of God. These doors may also be casually referred to as the “side doors”. 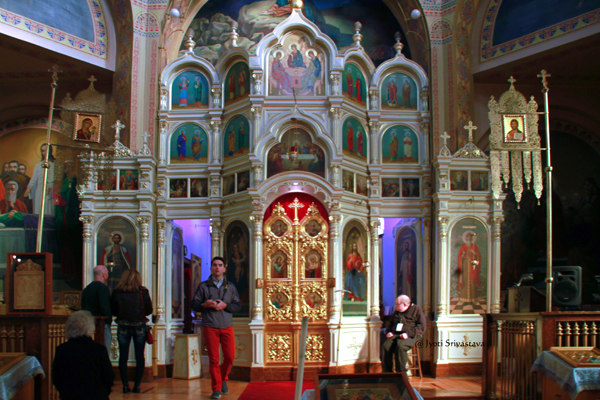 Notice that the north and south doors of the iconostasis were open. 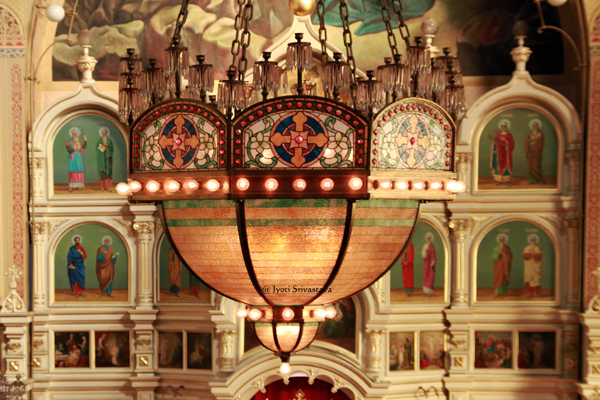 It gave an opportunity to glace into the sanctuary of the cathedral, behind the icon screen. In Nov 2016 a very important event happened at the cathedral – presentation of Tikhvin Icon set, a faithful reproduction of the Tikhvin Icon of the Mother of God to the Cathedral. [I visited the cathedral last year, in October 2015]. 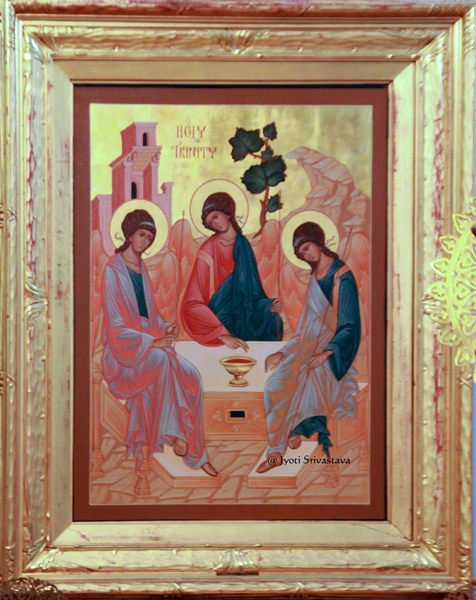 From the Holy Trinity Cathedral website.. click here..
Tikhvin Icon of the Mother of God – As is widely known, the original icon was ascribed to the hand of the Evangelist Luke and was enshrined in Jerusalem and later Constantinople before it appeared in northern Russia in the late 14th century. 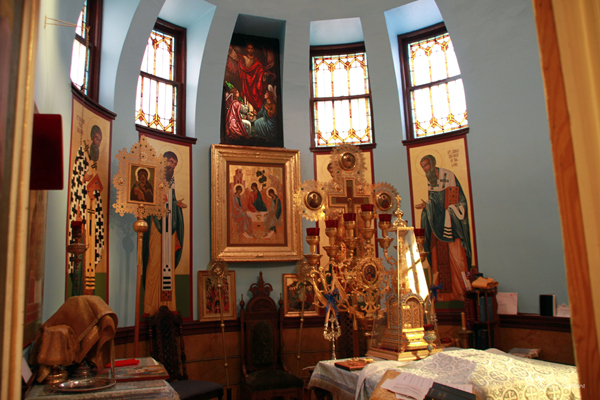 Enshrined in Tikhvin’s Dormition Monastery, where it remained until its closure and subsequent destruction by the Soviet authorities in the 1920s, the icon was taken to Latvia in the face of Nazi advances during World War II. 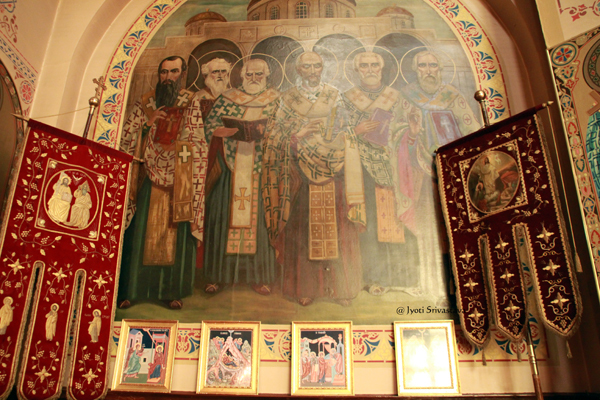 In 1949, His Grace, Bishop John [Garklavs] of Riga – later Archbishop of Chicago – brought the icon with him to the US, where for many years it was enshrined in Chicago’s Holy Trinity Cathedral. 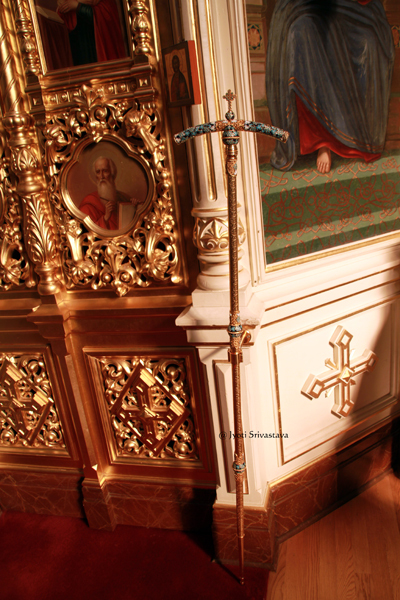 After Archbishop John’s death in 1982, his adopted son, Father Sergei Garklavs, was the icon’s guardian until it was returned to the Tikhvin Monastery in 2004. 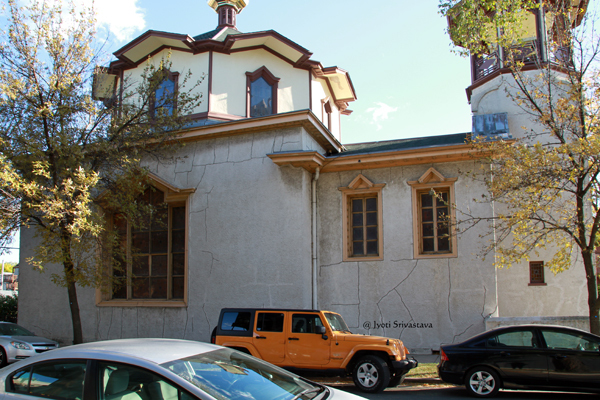 RESTORATION of Holy Trinity Cathedral: I visited the cathedral in October 2015. It looked like the church needed much repair. the cracks on the walls were obvious, as evident in the photos. Now the restoration work is in full progress..
A new website click here.. was created in 2008 to increase awareness of the Cathedral’s historic and architectural significance and serve as a primary method of communicating restoration progress. The site features photo galleries of each major phase, historical perspective, and progress reports.